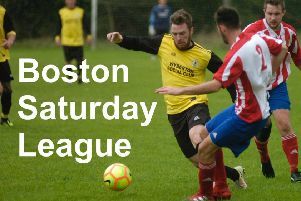 The Boston Saturday Football League has kicked off another season, with plenty of goals and even a keeper getting on the scoresheet. East Coast, Fulbeck, Horncastle Town Reserves and two new reserve sides, Fosdyke Reserves and Boston College Reserves, have all joined the league. Several clubs opted for a blank fixture for the opening day, while East Coast had no coach to manage the side and had to pull out of their contest, leaving nine fixtures. In the Taylors Garages Premier Division, defending champions Wyberton Reserves came unstuck in spectacular fashion in their opening match as they began their defence of the title away at Pointon, falling to a 5-2 defeat. Pointon striker Ian Jacquest hit an impressive hat-trick while Jamie Andrews and Casey Kemp completed the rout. Spilsby Town thumped Heckington Millers 8-0. The Millers remained in the game during the first half as they trailed 2-0 to a home team who were slowly clicking into gear. A dominant second half display saw Spilsby completely overrun their opponents, and they could easily have run up double figures as several further chances went begging. Michael Hardy and Jordan Smith both grabbed a brace, while Jordan Turner, Josh Wood, Jordan Wood and Eddie Rich made sure of a faultless start to their campaign. There were more goals at Swineshead Institute where the home side eventually saw off the challenge of Ruskington Rovers. The 6-2 home win was probably slightly misleading as Ruskington found themselves trailing only 3-2 for the majority of the game. It was only a late goal blitz that finally saw Swineshead put the game to bed. Swineshead’s match-winners were Jack Houghton (two), Richard Barker (two), Bert Snaith and Callum Simmons. If there was glut of goals in the top flight, the opposite was evident in the Taylors Peugeot Division One, where only one goal was scored in the two games. Freiston and Fishtoft produced a dour 0-0 draw, although Freiston went close with two efforts which struck the woodwork. Railway started life in Division One with an away trip to FC Kirton, and the newly-promoted side were very much on top throughout. As the game wore on Railway created chance after chance but FC Kirton Keeper Phil Mcallister kept his side in the contest with a string of important saves. That was until the game entered the final five minutes when a Ryan Mason cross from the left wing found debutant Leon Creasey, and he headed home to seal an opening day victory. In the Taylors Ford Division Two, Fishtoft Reserves hosted Sibsey - and the home side didn’t get off to the best of starts as they ended up empty-handed. Sibsey enjoyed most of the possession early on and they were rewarded with the opening goal when a long throw caused panic in the Fishtoft box and the ball fell loose to a Sibsey player who tapped the ball home. It didn’t long for the away side to double their lead as Fishtoft lost possession and Sibsey broke away and rounded the Fishtoft keeper before sliding the ball home into an empty net. As Fishtoft tried to get back into the game, a couple of chances in quick succession went begging and Sibsey made them pay with a third from a corner due to miscommunication in the Fishtoft defence. Fishtoft came out revitalised for the second half, knowing they had under performed in the first half and they really pushed on to try and get back in the game. They finally got on the score-sheet when a corner was bundled home by Jack Cridland. Fishtoft’s heads were up now and when another corner was whipped in by Liam Reece it was headed home by Ben Carter to give them a glimmer of hope. With time running out, Sibsey were reduced to 10 men with a red card following a last-man challenge when the Fishtoft striker was through on goal, but from the following free kick, the visiting defence blocked the shot and instantly broke away on the counter to score and make the final score 4-2. The Taylors Vauxhall Division Three saw a strong Benington Reserves side given a stern test by Holbeach Bank who, on this showing, will be looking to bounce straight back up following last season’s relegation. The visitors created a number of good chances in the opening period, but were foiled by an inspired display from Will Newton in the Benington goal. Benington then broke the deadlock on the stroke of half-time when Ryan Lawson rifled home from the edge of the box. Gavin Bell doubled the home side’s advantage midway through the second period when he lobbed the advancing Bank goalkeeper after being sent clear by a sublime Dean Stevens pass. Bank halved the deficit late on from the penalty spot but, despite some sustained pressure, were unable to find an equaliser. Spalding Harriers travelled away to Leverton Reserves where the strong wind played a major factor in the game, with the visitors struggling to push beyond the halfway line for most of the first half. Leverton struck first when Craig Mitchell swept home from the edge of the area to put Leverton ahead. A quick throw in then found its way to James De Lorenzo who also found the bottom corner from the edge of the area. Leverton continued to press for a third, first hitting the crossbar and then when a stray pass from the Spalding keeper left Leverton 30 yards out with an open goal, they missed the target and it remained 2-0 at the break. The second half saw Spalding able to use the wind to apply pressure and attempt to keep Leverton contained in their own half. The home side defended stubbornly, but luck wasn’t on their side when a long-range effort from Regan Smalley found itself being carried goalwards before finding the far top corner. Leverton did have chances to extend their lead but a couple of poor finishes from close range kept Spalding in the game - both efforts being fired straight at the keeper. The Spalding goalkeeper had the final say too, when he produced a huge clearance which sailed high over the opposing keeper’s head and into the net, much to the surprise of everyone. Leverton were therefore left cursing their luck and Spalding breathed a sigh of relief after their bizarre last minute equaliser. Wyberton A and Boston Titans produced a very tight match at The Causeway and the visitors were thankful, once again, for the finishing prowess of striker Matt Howden, who bagged a hat-trick in a 3-3 draw. The Titans’ Mike Mcphail was also at his creative best with two assists for his team. Wyberton salvaged a point with goals from Jack Reeson, Logan Hare and Jason Allen.